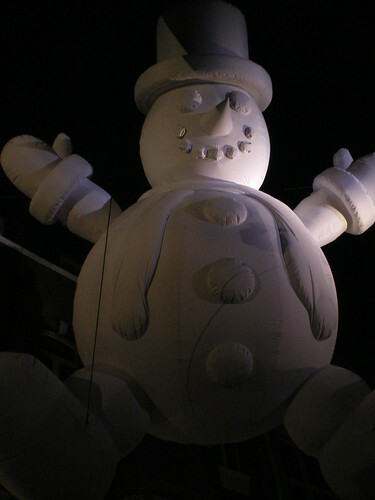 The Sinister Snowman wishes you all a Happy Christmas. I meanwhile am sat wondering how I fell asleep and woke up to notice that I was suddenly 27, why it’s an age that almost calls for an adult approach to life, certainly now that I’m doomed to pay full fare on the trains and tube these are harsh times. Exciting “where did the year go, exactly?” post to follow. In continued flickr-blogging it would seem my vibrant sunset is liked by a few folk. This entry was posted in General and tagged 27, Christmas, happy christmas, sinister, snowman on December 25, 2008 by Alex. Not so very sinister, or perhaps I’m just in a positive mood for once. Happy Christmas and Happy Birthday as we are birthday twins (though definitely not birthdate twins).